When it comes to Doctor Who stories, my favourite ones are always those set in the past. There is something extremely enjoyable about the Doctor travelling to historical places, witnessing important events and sometimes even being the cause of them. 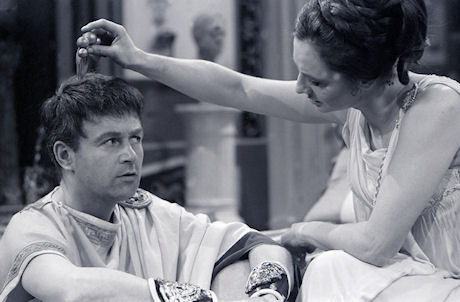 Which is why I thought ‘The Romans’ was one of the best Hartnell serials so far. Part of me, I must say, was imagining that this serial was happening in the same universe (which it is) as The Stone Rose, and I like to think Rose’s statue was in there somewhere. End of thought. Let’s talk about ‘The Romans’! It confused me a bit at first, because it looked as if I had missed a couple of scenes: the TARDIS crashes and suddenly the Doctor, Vicki, Ian and Barbara are enjoying life and spending a few weeks on a holiday resort in the 1st century AD. Which fine by me, I would do that too! The serial is a total comedy of intrigue, which is what makes it so great: the Doctor and Vicki decide to take a trip to Rome while Barbara and Ian are left alone in the villa to shamelessly flirt and get drunk. Unluckily for them, they are attacked and sold into slavery –alas, they cannot really defend themselves because they are drunk, and also because Barbara accidentally slams a jar into Ian’s head. 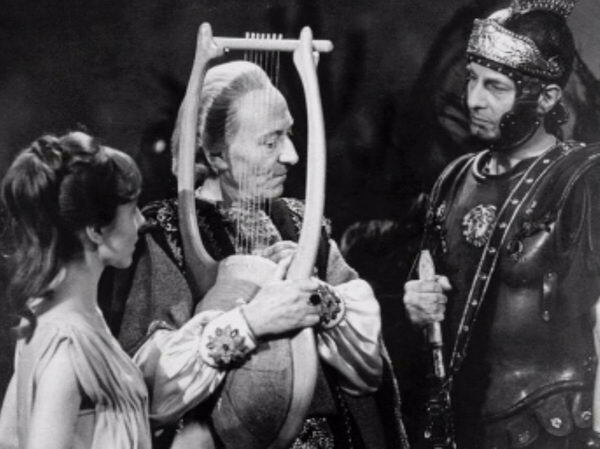 At the same time, the Doctor is mistaken for a famous harpist who was meant to be killed (and actually is) and who was part of a plot to kill Emperor Nero. 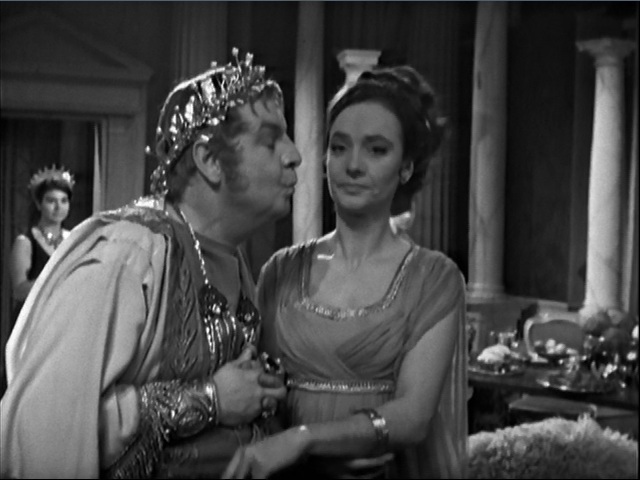 The Doctor and Vicki end up in Nero’s palace and a series of hilarities ensue, mostly thanks to Hartnell, who delivers some of the best bits of the serial thanks to his comedy talent. Of course, at the same time Barbara ends up being sold as a slave to Nero’s wife, which ends up with the emperor obsessing about her and following her around –which might have seemed funny back then, but I found it absolutely terrifying. Ian, being the splendid hero that he is, has the sole focus of rescuing Barbara, even though he goes through quite a lot: first condemned to the galleys and then forced to fight as a gladiator. In the end, after four episodes in which the characters kept missing each other, our four heroes reunite and leg it. 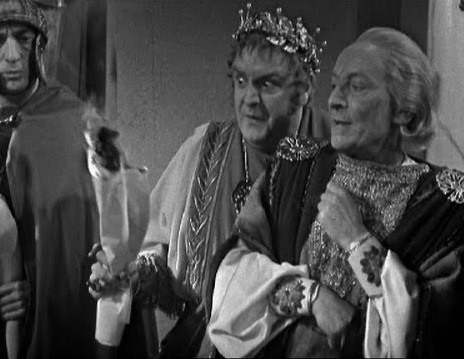 But not before the Doctor accidentally gives Nero the idea for the Great Fire of Rome –“We’re only here as observers” HA! The moment itself was hilarious, but when the Doctor actually realised that the fire might have happened because of him, he seemed disturbingly amused. Let me tell you this, Ten or Eleven would not approve. But then again, Hartnell’s Doctor is young, right? So what made this serial so great for me was the comedy of intrigue vibe, the constant “almost” moments, the buffoonery of Nero’s petulant character, who seemed straight out of a scene from Life of Brian, and Hartnell’s comicalness. I must say, by the way, with this being the first serial I watch without Susan, that I find Vicki to be a bit of an improvement (that doesn’t mean I love the character), even if sometimes I find her attitude towards the Doctor confusing, because she either looks at him in a daughterly way or in a “let’s get it on” way. Gross, especially because she has that same childish thingy that Susan had going on. Nevertheless, I only see Vicki’s incorporation as what one does when your old cat has died and you buy a new one because you are still in denial. Loved this one. The Doctor’s trickery with the harp was class.